Your home is supposed to provide a sense of security. It should be a place where you feel completely comfortable. The problem is that as you age it becomes increasingly difficult to navigate around your home safely. Most homes simply aren’t designed with the elderly in mind. Bathrooms are particularly hazardous for the elderly. That’s why when making your home more accessible, the first place you should start is your bathroom. Here are 5 ways to make your bathroom more accessible. Installing grab bars is probably the easiest way to make your bathroom more accessible. In fact, some showers already have grab bars installed. If yours doesn’t, it’s definitely the first thing you should do. You can also install grab bar near the toilet to help you sit down and get up. Grab bars are simple, cheap, and effective which is why we recommend starting here. Sinks are generally made with the average person in mind. Obviously, not everyone fits this mold, but for most people it doesn’t matter if the sink is a bit too high or a bit too low. When you’re elderly or experiencing a disability, on the other hand, it can make a huge difference. Some people may find that they need to lower their sink while others may need to raise it. If you have a wheelchair, for example, it might be a good idea to raise the sink to make sure your wheelchair has enough room. The same would apply if you’re tall and have to bend down to reach the sink. This is bad enough for your back when you’re young, but as you age having to bend down too much can be excruciating. 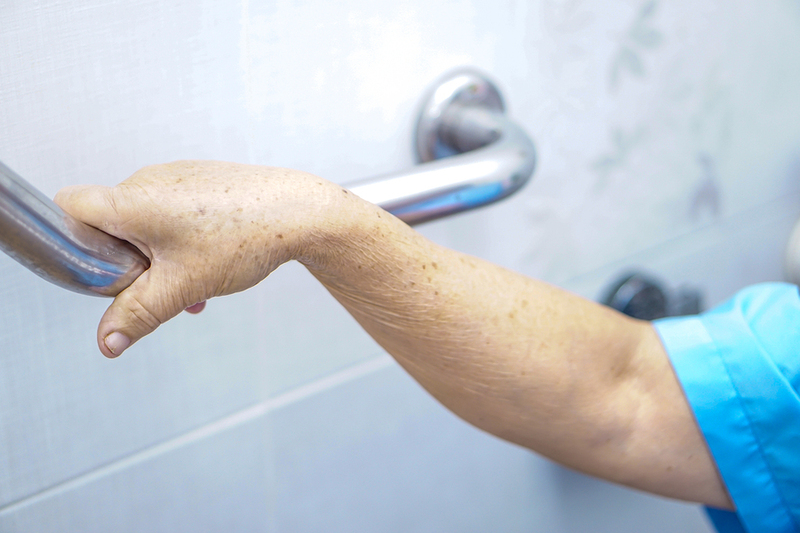 Even a simple act such as getting on and off the toilet can also become dangerous as you age. A low toilet can make it more difficult to sit down and get up. A high toilet can make it difficult to get onto the toilet if you have a wheelchair. Just like with your sink, there is no one-size-fits-all solution here. You’ll need to consider your individual needs and make the appropriate adjustments. Most bathroom falls occur when getting in and out of the shower. This is partially because many showers are combined with baths. Constantly having to lift your legs to step into the shower is stressful and introduces an unnecessary risk. Installing a walk-in shower is a great way to get around this. Not only are they easier to get into, they also give you much more room to move around while you’re showering. It should come as no surprise that bathrooms get slippery. It’s all too easy for some water to slip past your shower curtain and this can turn your standard bathroom tile into a significant safety hazard. Fortunately, this isn’t a difficult fix, even just adding a few strategically placed rugs to your bathroom can make it much safer. If you want to make it as safe as possible you can install slip-free tiles. This option is more expensive, but the peace of mind is usually worth it. An accessible bathroom is just the first step towards a safer home. If you have any questions at all about making your home a safer place to live, don’t hesitate to contact us at Community Renovations today.